Synthetic peptide corresponding to Human NF-kB p65 aa 500 to the C-terminus (C terminal) conjugated to Keyhole Limpet Haemocyanin (KLH). This antibody gave a positive signal in the following lysates: Mouse Spleen Tissue, HeLa Whole Cell, A431 Whole Cell WB: Human fetal brain, kidney and lung tissue lysates. Batches of this product that have a concentration < 1mg/ml may have BSA added as a stabilising agent. If you would like information about the formulation of a specific lot, please contact our scientific support team who will be happy to help. Our Abpromise guarantee covers the use of ab16502 in the following tested applications. IHC-FoFr Use at an assay dependent concentration. IHC-P Use a concentration of 1 - 5 µg/ml. Perform heat mediated antigen retrieval before commencing with IHC staining protocol. WB Use a concentration of 0.5 µg/ml. Detects a band of approximately 64 kDa (predicted molecular weight: 60 kDa).Can be blocked with Human NF-kB p65 peptide (ab16636). Abcam recommends using milk as the blocking agent. Lanes 1 - 4: Merged signal (red and green). Green - ab16502 observed at 70 kDa. 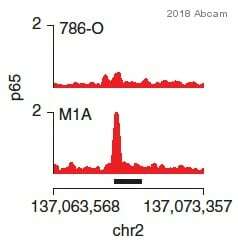 Red - ab8245 loading control, observed at 37 kDa. ab16502 was shown to react with NFκB p65 in wild-type HAP1 cells along with additional cross-reactive bands. 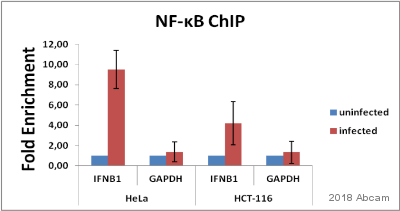 No band was observed when NFκB p65 knockout samples were used. Wild-type and NFκB p65 knockout samples were subjected to SDS-PAGE. ab16502 (NFκB p65) and ab8245 (loading control to GAPDH) were both diluted 1/1000 and incubated overnight at 4°C. 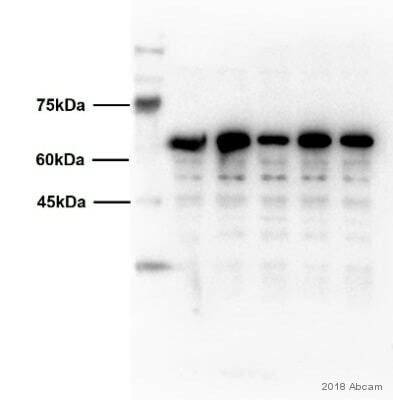 Blots were developed with Goat anti-Rabbit IgG H&L (IRDye® 800CW) preadsorbed (ab216773) and Goat anti-Mouse IgG H&L (IRDye® 680RD) preadsorbed (ab216776) secondary antibodies at 1/10 000 dilution for 1 hour at room temperature before imaging. IHC image of NF-kB p65 staining in human breast carcinoma FFPE section, performed on a BondTM system using the standard protocol F. The section was pre-treated using heat mediated antigen retrieval with sodium citrate buffer (pH6, epitope retrieval solution 1) for 20 mins. The section was then incubated with ab16502, 1µg/ml, for 8 mins at room temperature and detected using an HRP conjugated compact polymer system. DAB was used as the chromogen. The section was then counterstained with haematoxylin and mounted with DPX. ICC/IF image of ab16502 stained human HeLa cells. The cells were methanol fixed (5 min) and incubated with the antibody (ab16502, 1µg/ml) for 1h at room temperature. The secondary antibody (green) was Alexa Fluor® 488 goat anti-rabbit IgG (H+L) used at a 1/1000 dilution for 1h. Image-iTTM FX Signal Enhancer was used as the primary blocking agent, 5% BSA (in TBS-T) was used for all other blocking steps. DAPI was used to stain the cell nuclei (blue). Alexa Fluor® 594 phalloidin was used to label F-actin (red). 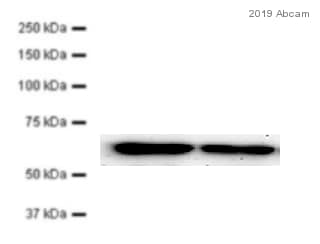 NF-kB p65 was immunoprecipitated using 0.5mg Hela whole cell extract, 5µg of Rabbit polyclonal to NFkB p65 and 50µl of protein G magnetic beads (+). No antibody was added to the control (-). The antibody was incubated under agitation with Protein G beads for 10min, Hela whole cell extract lysate diluted in RIPA buffer was added to each sample and incubated for a further 10min under agitation. Proteins were eluted by addition of 40µl SDS loading buffer and incubated for 10min at 70oC; 10µl of each sample was separated on a SDS PAGE gel, transferred to a nitrocellulose membrane, blocked with 5% BSA and probed with ab16502. 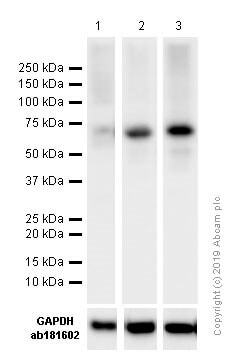 Secondary: Mouse monoclonal [SB62a] Secondary Antibody Anti-Rabbit HRP (IgG light chain) (ab99697). Immunohistochemistry (Formalin/PFA-fixed paraffin-embedded sections) - Anti-NF-kB p65 antibody (ab16502)Image from Qu D et al. PLoS ONE. 2015; 10(8): e0134212. Fig 5. doi:10.1371/journal.pone.0134212. Immunohistochemistry (Formalin/PFA-fixed paraffin-embedded sections) analysis of VillinCre;Dclk1f/f mouse colon tissue sections labeling NF-kB p65 with ab16502 (brown). Alcian blue was used for counterstaining.Heat-induced epitope retrieval was performed on 4-μm formalin-fixed paraffin-embedded sections by utilizing a pressurized Decloaking Chamber in citrate buffer (pH 6.0) at 99°C for 18 min. For brightfield microscopy, slides were exposed to peroxidase blocking solution prior to the addition of primary antibody (ab16502). After incubation with primary antibody overnight at 4°C, the slides were incubated in peroxidase-conjugated polymer. Immunohistochemistry (Formalin/PFA-fixed paraffin-embedded sections) analysis of Dclk1f/f mouse colon tissue sections labeling NF-kB p65 with ab16502 (brown). Alcian blue was used for counterstaining.Heat-induced epitope retrieval was performed on 4-μm formalin-fixed paraffin-embedded sections by utilizing a pressurized Decloaking Chamber in citrate buffer (pH 6.0) at 99°C for 18 min. For brightfield microscopy, slides were exposed to peroxidase blocking solution prior to the addition of primary antibody (ab16502). After incubation with primary antibody overnight at 4°C, the slides were incubated in peroxidase-conjugated polymer. ICC/IF image of ab16502 stained MCF7 cells. The cells were 4% PFA fixed (10 min) and then incubated in 1%BSA / 10% normal goat serum / 0.3M glycine in 0.1% PBS-Tween for 1h to permeabilise the cells and block non-specific protein-protein interactions. The cells were then incubated with the antibody (ab16502, 1µg/ml) overnight at +4°C. The secondary antibody (green) was goat anti-rabbit DyLight® 488 (IgG - H&L, pre-adsorbed) (ab96899) used at a 1/250 dilution for 1h. Alexa Fluor® 594 WGA was used to label plasma membranes (red) at a 1:200 dilution for 1h. DAPI was used to stain the cell nuclei (blue) at a concentration of 1.43µM. Observed band size: 64 kDa why is the actual band size different from the predicted? Immunohistochemistry (Formalin/PFA-fixed paraffin-embedded sections) - Anti-NF-kB p65 antibody (ab16502)This image is courtesy of an anonymous abreview. ab16502 staining NF-kB p65 in murine peritoneal tumour cells by Immunohistochemistry (Formalin/PFA-fixed paraffin-embedded sections). Tissue was fixed with paraformaldehyde and blocked with 1% BSA for 60 minutes at room temperature. Samples were incubated with primary antibody (1/1000) for 2 hours. An undiluted Alexa Flour®647-conjugated goat anti-rabbit IgG polyclonal was used as the secondary antibody. ab16502 stining the nuclei of the cardiac cells in rat tissue. The tissues were fixed (animals perfused fixed) with 4% PFA and later postfixed overnight in the same fixative. They were cryoprotected in 30% sucrose and cut using a cryostat. ab16502 at a 1/500 dilution staining Asynchronous and paraformaldehyde-fixed (4%) HeLa cells by immunocytochemistry. The antibody was incubated with the cells 30 minutes and then detected using a Cy3 conjugated Goat Anti-Mouse IgG (H+L) antibody. This image is courtesy of an Abreview by Kirk McManus submitted on 27 February 2006. 786-O clear cell renal carcinoma cells. Metastatic renal cancer cell obtained from 786-O parental line.